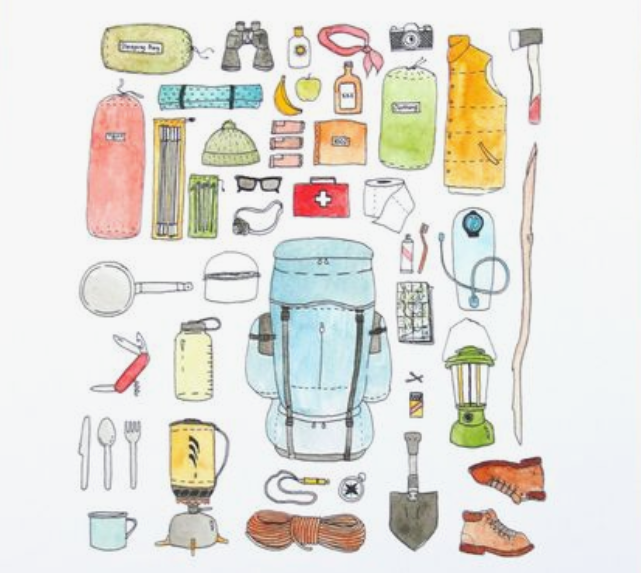 Every seasoned camper has a checklist of items necessary for survival in the wild. The list can be shortened or lengthened according to the type of trip you’re planning and the availability of items at or near the campsite. Having the necessary items and careful planning can make a huge difference in whether you enjoy the experience or vow never to return. The items will vary each time because of the climate, terrain and activities you’ve planned, but some will remain the same and become your master list. Food and water are the first items to plan. Plan every meal meticulously and be sure you have the ingredients and utensils for preparation. The more you can pre-prepare at home, the more time you’ll have to enjoy the activities. A chuck box can hold many of the items you’ll need. It can be plastic or any type of crate and you can store utensils and other stuff needed for cooking and meal prep such as spices and cooking oil. Other important items for meal prep and cleanup are a wash tub, sponge, pot holders, dish towels, plates, bowls and eating utensils. Knives, coffee pot, frying pan and Dutch oven are typical camping essentials that you’ll want to be sure and pack. A first aid kit can be purchased most anywhere and should contain a pain/ fever reliever such as aspirin, antacid, band aids, ointment such as Neosporin, tweezers, nail clippers and Chap Stick. Camp stove, propane, shovel, tent, blankets and/or sleeping bags, lantern, chairs, tarp and extra padding for sleeping bags should also be on your master checklist. Personal items should be stored in your personal Dopp kit (toiletry bag). Toothbrushes, toothpaste, deodorant, brush, comb and other grooming elements that you would take on any trip should be in an easy-carry bag so you can trek to the showers/toilet with it. Finally, tell someone where you’ll be, when you’re leaving and when you might return. It’s also a good idea to provide routes you may take and cell numbers of you and others with you. A description of your vehicle and its license plate number should be left with someone you trust. And, you should always provide the local government agencies such as the State Police or Sheriff’s Department where you’ll be located. Some websites have cheat sheets or master campers’ supply lists that you can download and print out for easy accessibility and less work on your part. It’s a shame if you arrive at your camping destination, set everything up and then realize you’ve forgotten some non-expendable items. Your camping needs will be different than others, so customize the list accordingly and check it frequently so you don’t forget the important stuff.